Watching the Knicks play this year has become a lost cause. The losing streak has hit 18 games, and they are 37 games under .500. It truly does not matter who they throw on the court, but on the bright side… #1 pick?? Atlanta, on the other hand, has shown a competitive side for some games of late, including a big win over the Lakers the other night. They are definitely trending in the right direction. Where to begin when talking about the Knicks? Well on the (extremely small) bright side, Dennis Smith Jr. and DeAndre Jordan have both been playing well since coming over in the totally unexpected Porzingis trade, putting up numbers every night in which they are on the floor. Kadeem Allen has been playing well as the back-up point guard to DSJ, with a few different guys still out with injuries. Nevertheless, this team is just not winning much. Kevin Knox has continued to show growth as a playmaker and scorer, while Damyean Dotson knocks down all of his three balls. But as expected, they remain in the bottom six in both points for (#26) and points against (#25) in the NBA. This is not a season to be happy about if you are a Knicks fan, no matter who you may be able to draw in this coming summer’s draft. Just keep hoping for Zion is all these wild Knicks fans can do with a 10-47 record. They have looked very good of late, and the most impressive thing from Atlanta was rookie PG Trae Young posting a wild stat-line to lead them over LeBron’s Lakers, hitting some big shots against James in the waning moments to seal the deal. John Collins has continued to impress those all around the league, with his 19-10-2 asts on 58% shooting from the floor. Young has really improved his shooting and is averaging 17 points and nearly eight assists a contest. 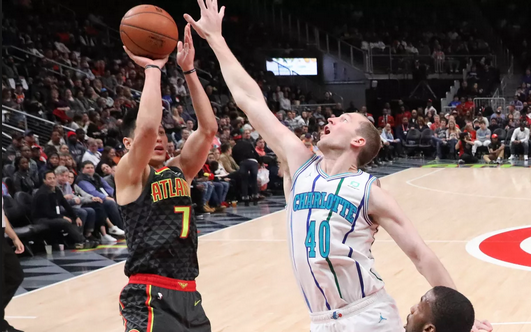 With Jeremy Lin gone, it is on Young to show what he learned. They have some savvy veterans to go along with the young guys, including Kent Bazemore, who is back and making plays again. The extent of his minutes and playmaking opportunities will really help determine his trade value for the summer, which could be high with just one year finally left on the deal signed in the summer of overpaying across the board. Dewayne Dedmon and Alex Len continue, when healthy, to hold down the fort at the center spot. Ah yes. Death, taxes, and the Knicks losing games. That’s the motto for 2018-19. Nobody on the team will be able to help dig them out of this one. Atlanta’s strong performances from Collins and Young, the two young-guns, will help to power them to another win!